In Christianity, human emotions are often considered to be misleading and untrustworthy-a lingering part of our fallen nature that distract us from God's truth. But our emotions were created by God, and though the enemy may seek to manipulate our hearts, Jesus sets us free! Dr. Mark Virkler is a trusted authority on prayer, hearing God's voice, and inner healing. 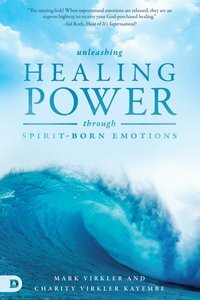 In Unleashing Healing Power Through Spirit-Born Emotions, Dr. Virkler and his daughter Charity, help you to see emotions as unique channels through which the Holy Spirit works to bring miraculous life-transformation, deliverance and healing. Jesus died to redeem your whole person-not just your reason and intellect. This makes it possible to move beyond anxiety, confusion, and uncertainty. When you are made alive in Christ, you can hear God speaking through the emotions of your "New Self." About "Unleashing Healing Power Through Spirit-Born Emotions: Experiencing God Through Kingdom Emotions"
MARK AND PATTI VIRKLER have been married and dedicated to full-time ministry since 1972. Both received their Bachelor degrees from Roberts Wesleyan College and have also earned Master and Doctoral degrees. Together they have co-authored more than 60 lamad-style books in the areas of hearing God's voice and Spirit-anointed living.